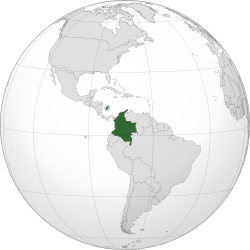 ↑ (Spanish) Constitution of Colombia, 1991, Article 10. ↑ (Spanish) Colombia a country study, 2010, pp. 86, 87. ↑ ୩.୦ ୩.୧ "Animated clock". Colombian State Department. Retrieved 4 February 2012. ↑ ୪.୦ ୪.୧ ୪.୨ ୪.୩ "World Economic Outlook Database". International Monetary Fund. April 2012. Retrieved 11 September 2012. ↑ Indicadores Internacionales sobre Desarrollo Humano – PNUD. Hdr.undp.org. Retrieved on 14 May 2012.